We're looking for a few good horse people with big hearts. Are you that person? If you have a lot to give, read on. Horses Forever needs to have good contacts around the U.S. who can evaluate horses in need, on the spot, and make a decision as to whether we need to move a horse into a "protective safe home" or what other things need to be considered about a horse's particular current situation. If there is a "seizure," a local person who makes an immediate contact on our behalf helps a great deal. Sometimes it takes our main office several days to get the attention and develop the credibility with local law enforcement or animal control officers or humane societies and that precious time can be reduced considerably if we have a "local" person—of impeccable reputation—to cut out the "red tape". If you would like to act as a representative for Horses Forever or provide facilities as a protective safe home, please email us your resume along with references. Your reputation must be impeccable and you must be experienced handling difficult horses as well as administering medical treatments under the supervision of a veterinarian. If you're ready to give your all for a horse who needs you, please visit our Adoption page or contact us. 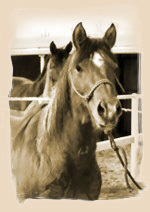 There is a program available, to certain qualified homes, for fostering our horses. Please view our Fostering application or contact us. Some of the expenses contained within a fostering program may be tax deductible. The program gives you a chance to take care of one of our " special" horses while enjoying its company and giving the horse some love and attention and maybe even riding. We are also looking to network with reputable rescue/equine life management organizations around the country. Please contact us with details of your organization and facilities. You don't have to jump in with both feet. Through our sponsor-a-horse program you can help us pay the hay man, the feed store, the farrier, the veterinarian etc. Pledge as little as $20 per month to sponsor a horse from this website who needs your love. You'll receive a certificate with your horse's picture and bi-annual updates on his status with us. Print and fill out the donation form. Be sure to note which horse you'd like to sponsor. There are many projects going on at the farm that could use a little boost to make them a success. We have an on-going wish list. Please contact us if you are able to help us out with an item or two from our wish list.